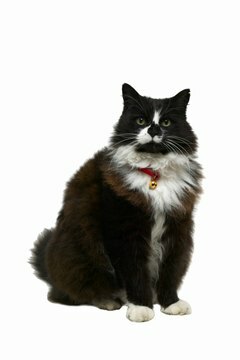 Can a Pregnant Cat Be Vaccinated? Those shots should wait until Kitty's had her kittens. If Kitty's expecting it's important to keep her healthy, for her and the kittens' benefit. Normally, most vets recommend core vaccinations as part of a cat's wellness plan. However, if Kitty's pregnant it's best to wait before getting her shots. Vaccinations can be harmful to her babies. Always consult an experienced veterinarian regarding the health and treatment of your pet. Vaccines work by provoking an immune response, because they contain antigens that mimic the organism causing the disease. When Kitty gets her shots, her immune system is stimulated and she produces antibodies to fight the antigens in the vaccine. If she's ever exposed to the real disease, her immune system has been prepared to recognize it and fight it off or minimize its impact on her. Not every cat needs every vaccine, and the American Association of Feline Practitioners classifies vaccines as core or non-core. Core vaccines are considered to be vital to all cats, and include feline calicivirus, feline herpesvirus type 1, panleukopenia (feline distemper) and rabies. Non-core vaccines are given based on Kitty's lifestyle, such as whether she goes outside or stays indoors, and include bordatella, feline leukemia virus, feline immunodeficiency virus and chylamydophila felis. Your vet will recommend which vaccines are important for Kitty's health. If Kitty's been kept up to date on her vaccinations and was current before her pregnancy, she should be fine. However, if she hasn't been vaccinated you should wait until after she's delivered her kittens. As Mar Vista Animal Medical Center notes, "developing kittens are vulnerable to live viruses used in modified live virus vaccinations, feline distemper in particular." A kitten can be born with birth defects, including cerebellar hypoplasia, which is a brain malformation resulting in tremors and wobbling when the cat attempts a specific task. Other vaccines can cause a cat to abort her kittens. Kittens should receive their first vaccinations around eight weeks of age. At this point they should be weaned and any immunity they've gained from Kitty's milk will be waning. The kittens will require booster shots at four-week intervals, at 12 and 16 weeks. Kitty's vaccination schedule will depend on her history and her lifestyle. Although there's no hard and fast rule about when to vaccinate after she's delivered her litter, she may appreciate waiting for her shots until the kittens are weaned. You should discuss her vaccination needs with your vet to determine the ideal time to vaccinate her. What Are the Most Common Cat Vaccinations to Get? What Kind of Side Effects Can Cats Get From Feline Shots?